Baroness very nearly ceased to exist four years ago. By cruel irony, the palpable sense of momentum that surrounded the group around the release of their magnum opus “Yellow & Green” came to a sudden stall when, in adverse weather conditions, the brakes of the iconic, yet elderly tour bus carrying them failed and sent band and crew plummeting ten metres off a viaduct near Bath, United Kingdom. It was a miracle that all nine passengers lived to tell the story, but the crash nonetheless left indelible marks on the musicians; marks that had a profound and bittersweet impact on the band’s future. Drummer Allen Blickle and bassist Matt Maggioni, both of whom suffered multiple fractured vertebrae in the accident, quit, whilst frontman John Baizley published a life affirming letter vowing to push on with Baroness together with his longtime collaborator, guitarist Peter Adams — this despite shattering his arm so completely, it nearly had to be amputated. Along the eastern banks I ran, ‘til no more could I stride. No wing nor cloven hoof would let me stay rolling tide. Across the coastal banks she runs, and gallops towards the sea. But I cannot outrun the beast that bears my sanity. 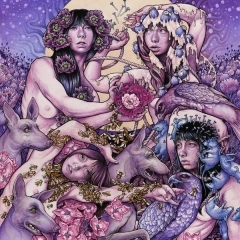 The above prose is an excerpt from “Try to Disappear”; a checkmate even to the unforgettable hit “Take My Bones Away”, the song is the perfect embodiment of the ambition underlying “Purple”, which boasts some of the biggest, strongest music Baroness have written. As soon as Baizley’s sombre voice avows that ”[he] will bury your bones inside [his] garden. Underneath, your eyes can’t burn through [him] anymore. [He] will throw a golden anchor in the harbour, tie you by your chain to the ghost on the ocean floor” over a muted riff at its start, you just know the remaining four minutes will be special. Quite right — once the song kicks into a gallop for the chorus, simple yet honest, and emblazoned with a mighty riff at the end, you won’t soon forget Baizley’s soaring resolve as he roars ”You tried to disappear! So long, I followed you” and eventually ”If you try to disappear, I’m just around the bend. So long, I followed you. When you try to run and hide, it warms my little heart. So long, I followed you.” The two songs leading up to this early climax are outstanding too. “Morningstar" harks back to ”The Red Album” with the sort of heavy, jagged riffs and fluid esoteric melodies that earned the band likenings to Mastodon early in their career, while “Shock Me” recalls the elegance and uplifting tone of the ”Blue Record”, and sees Baizley optimistically confronting a sudden, new reality. You never sang so sweetly ’til you whispered in my ear. I never heard a sound but I could hear, the hatchet man dusting off his sleeve. Contrary to what most people expected thus, “Purple” refuses to wallow in misery. The sullen qualities are there, but from a dire situation has emerged a Baroness hellbent on finding strength in misfortune. It sounds like a natural continuation from “Yellow & Green”, cherishing classic rock, indie, pop, alternative and even folk on equal terms with the sludge metal style that introduced them to the world in 2007 — only this time, the songs are even more potent, melodious and hook riddled. At just eight songs proper (“Fugue” is a relatively brief, instrumental intermezzo, and “Crossroads of Infinity” is but sixteen seconds of ambiance and the self-congratulating statement of ”We did it.” in a robotic voice), it is a little on the short side though — understandably, mind you, given the circumstances under which it was created — and has that frustrating quality of leaving you hungering for more as soon as it concludes. Still, one must not worry; having defeated their tribulations, Baroness are just getting started.